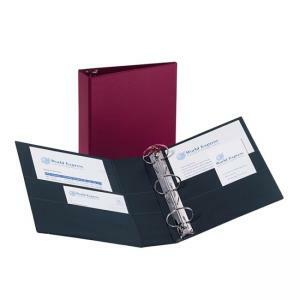 Textured cover on presentation binder provides durable document protection and a contemporary/professional look. Gap-Free ring design prevents gapping so pages turn smoothly. Wider front and back binder panels fully cover standard dividers and sheet protectors. Back-mounted rings allow pages to lie flat. Organize and secure paper with four stacked pockets. Black vinyl on the inside cover provides an elegant appearance. Holds 8-1/2" x 11" documents. Binder has exposed rivets on back.